At JoaLins we are dedicated to a quality breeding program that produces happy, well adjusted, well socialized puppies that have fantastic pedigrees. JoaLins accepts 5 deposits per litter, and reserves the right to retain two breeding quality puppies from any of our litters for our breeding program or other breeders’ programs. 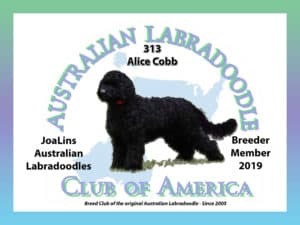 It is not uncommon for our reservation lists to fill up quickly, so please take the time to fill out and submit a Puppy Application form and make a deposit to reserve a spot if you are interested in changing your life by adding a current or future JoaLins multi-generational Australian Labradoodle puppy to your family! Puppies are matched with their new family by JoaLins when they are 7 weeks old. We take those 7 weeks to get to know the puppies and match the puppy’s personality and characteristics with the answers you provided on the Puppy Application. Puppies are matched in the order in which we receive the completed Puppy Application with the deposit. Please remember that the puppy that is perfect for your home in temperament and character may have a different color or marking than what you expected. Questions? Need more information? Send us an email using either our email address or the form that can be found on the “Contact Us” tab or call (813) 449-3359 during our office hours listed on our “Contact Us” page. Between caring for the puppies and our adult dogs and our family, we can’t always answer the phone, but please leave a message or let us know by email that you’d like to talk and we’ll get back to you promptly.